West Leeds community reporters tell their stories | West Leeds Dispatch | News. Views. Get involved! That was the main thing our new community reporters discovered at a special session aimed at helping people to write their own stories at Armley Junktion last night. Attendees included someone who was running an Alice in Wonderland-themed creative writers group for Armley and an Armley Junktion director wanting to get across the message that the cafe was about food recycling for diners of all backgrounds and not just so-called ‘poorer’ people. And there was a local volunteer who had a powerful story of how he found a job against all the odds. 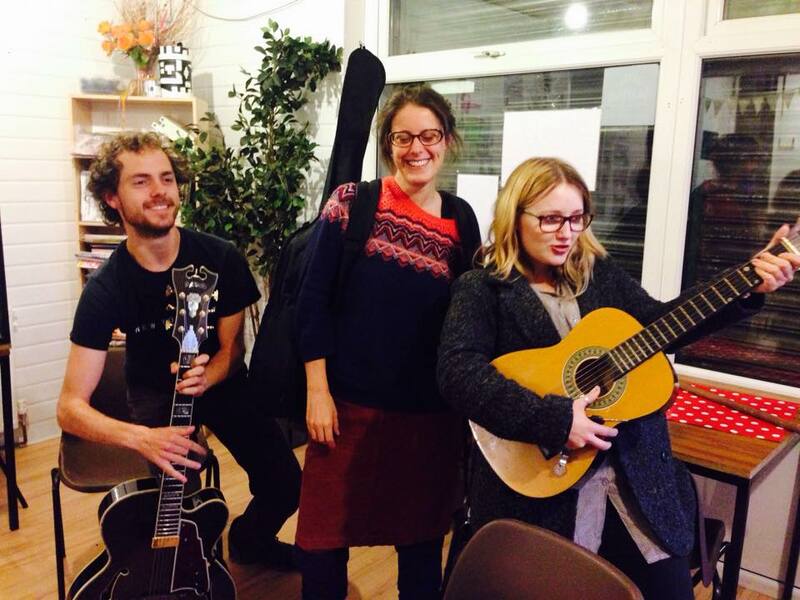 And when we arrived at Armley Junktion there was a free guitar lesson running. Armley resident Lorentz Bloom kindly runs the no-cost sessions every Monday, 6-7pm. All welcome. Great – and inspiring – community stories everywhere! Our community reporters discovered how to structure a story, the need for a good headline and the importance of photographs and/or video in a story. They’re at work now putting their stories together – we hope to bring you them on The Dispatch soon! Do you have a story to tell? The Dispatch is a platform for YOU to tell YOUR stories about your community. It could be you’re a member of a local group and want to raise its profile by telling people what you do, or you may be hot under the collar about a local issue – or simply have an achievement you want to shout about! Or you might fancy writing about a local community forum or public meeting. All contributions and ideas are welcome! Get in touch with us at news@westleedsdispatch.com or Tweet us @wldispatch – we’ll happily help you as much as we can. Our thanks to Armley Junktion for lending us their cafe for a couple of hours!